I shared that I am on “sabbatical” and I’ll fill you in more on what kind. It’s an ambition sabbatical. I was inspired by this idea from a friend a few years ago who did the same. Mine includes letting go of pursuing BIG massive visions of contribution and change and entrepreneuring combined, and instead focusing on small moments of deep and authentic connection. It's a conscious slowing from idea to manifestation to market, and it's for a year. It's a conscious slowing of the nervous system, in order to recalibrate and live in a new way, with new opportunities for insight and growth and healing and enjoyment of life and the people in it. In letting go of this big ambition and spiritual business building, I also had the grace of letting go of said ambition and scrambling and hustling and totally relaxing in to the model of service I already had going on in my professional life as a chiropractor. Since that time I have been loving the quiet care of one on one service to my clients. I have been loving the art of serving individuals, versus the craft of systematizing observations, patterns, and exact methods to serve broad groups and teach others to deliver such services. I have been able to relax into my own beautiful service based business, as well as my own intricate gifts without having to translate them in any way. It's somewhat of a luxury to be able to actually relax into one's life and realize it's actually totally enough. I recognize that for many, this isn’t yet the case, there is still a hustle need, and we are individual, not all need ambition fasts or social media fasts or any other kind. We are unique in unique chapters. There is rhythm and chapter in life, and we enter and exit these as spiritual beings having a human experience in a particular cultural time on the planet. Thus my love of unique and individualized care and conversation. I also thought to clarify,....I tossed my planner. Truth. I got another one! I still love things in writing, I just had to get rid of the one that was so ambition and manifestation focused and instead use one that is more relaxed with more of a mindfulness and conscious life rhythm focus. It makes me smile because I know it carries my self-care plans and my gentle reminders of what I am working on because that, yes, planning, is still an important part of my self-care and life enjoyment. Next up, a lot of you asked how to make the leap from social media plug-in to social media plug-out, specifically the Facebook one. To this I have a story. Ten years ago when I was in India, working on a service project, the Guru of the ashram I was going to work at took me aside for a meeting. For this meeting he got in the ashram car and had me come along. If you have ever driven in India, then you know, it’s totally bonkers on the roads with motor bikes, buses, rickshaws, trucks, cattle, bicyclists, sadhus, and the occasional elephant. As he drove, he drove really slow, and it was like a river of chaos going around us both coming and going on all sides. He said, sometimes, to stay safe when everyone around you is going chaotically fast, you just go slow so they can all move around you. Well, in this cultural case, it’s kind of like that. You actually can slow down, and the chaos can move around you, and then something magical can happen. You can begin to notice others who have also slowed down, and, you can begin to notice yourself. You can be there for you, and you can also hear the messages of life around you not being generated by technology constantly. Life can speak through the actual spiritual matrix of life itself. The birds and animals that emerge with a story to tell. The people who cross your path in lucid moments. The people you think of and then reach out to directly to connect to. And, learning and growth also arrives that is desired. This learning and growth can be from outer and inner influences. You actually start to disconnect from a matrix of false senses of spiritual connection, and you realign to a living matrix of a Universal Intelligence that is responsive and moving through all of creation and in that matrix, you feel yourself again, alive, divine, as you are. And of course, this feeling, this remembering, fluctuates with forgetting and remembering and forgetting and remembering, but it’s there, and it feels far more real and long lived than the other to me. I was reminded last weekend in a "Life/Art" dance workshop with Ana Halprin's daughter Daria Halprin that life truly is a dance. It's not an arrival point. It's not an intellectual occurrence. It's a dance, an intersection, of body, motion, emotion, story, meeting the moment, meeting ourselves, meeting others, and meeting nature. Ana is 98, and her daughter is in her 70's, and they both continue to dance and create. They inspire me deeply in the art of healing and remaining alive while you are alive, and one of the qualities I see them embody strongly is curiosity. Not knowing. Curiosity. So there you have it, there you have me, curious, willing to step forward like Joseph Chilton Pearce encouraged me to do years ago when I had the grace of meeting him. He said you can take a step forward, essentially into nothing, and something always forms underfoot. Embodying the Heart, honoring the innate truth of one's soul, these things take courage and a willingness to go into the unknown. In witnessing my own journey of this and the lives of those I get to hold as a chiropractor, and your immense response to last week's email, you can know that if you are relating to this sharing, or years ahead on embodying it, you are not alone. You are absolutely a part of a movement of humans awakening and asking what is next, and here we are then, embodying the answer with our inquiry, aspirations, and authentic desire to connect to ourselves, one another, and that which feels real. We are literally taking a step OUT of what culture is saying to do, and we are landing into that which is real. And newness, birth, healing, creating, and living are sometimes very messy and painful and there are vast unknowns, but here we are. When we hit the road on the personal growth path, we are often faced with paradox. I happen to think it’s because we live in a paradox world. Want to feel joy? Gotta know what pain is. In fact, have to be willing to feel both. You get it. Today I want to touch upon the paradox of self-responsibility and self-compassion. I’ve been deep diving of late into the book “The Little Money Bible” after our December You Matter International Money Mindset workshop. In fact, I’m having fun sharing a quote a day inside of our You Matter International FB group in order to keep meditating on quotes from it this month. Ultimately then, our abundance or lack thereof, is part of accepting our responsibility for where we are at in the world. And taking responsibility sounds great, until you become a victim of something atrocious, or you get diagnosed with that illness, or you are simply born into rotten circumstances. So how do we honor our victimhood to life while looking to claim our wholeness, our healing, our empowerment? I think that it lies in accepting a metaphysical responsibility for where we find ourselves now, as conscious adults, in life, because it is from here that we can then find the empowered view that brings us the traction to move into a renewed state of living. It is then that we can claim our power in life so as to move forward with forgiveness, love, strength, and wisdom. From there we can then truly live life with joy, abundance, and loving relationships. 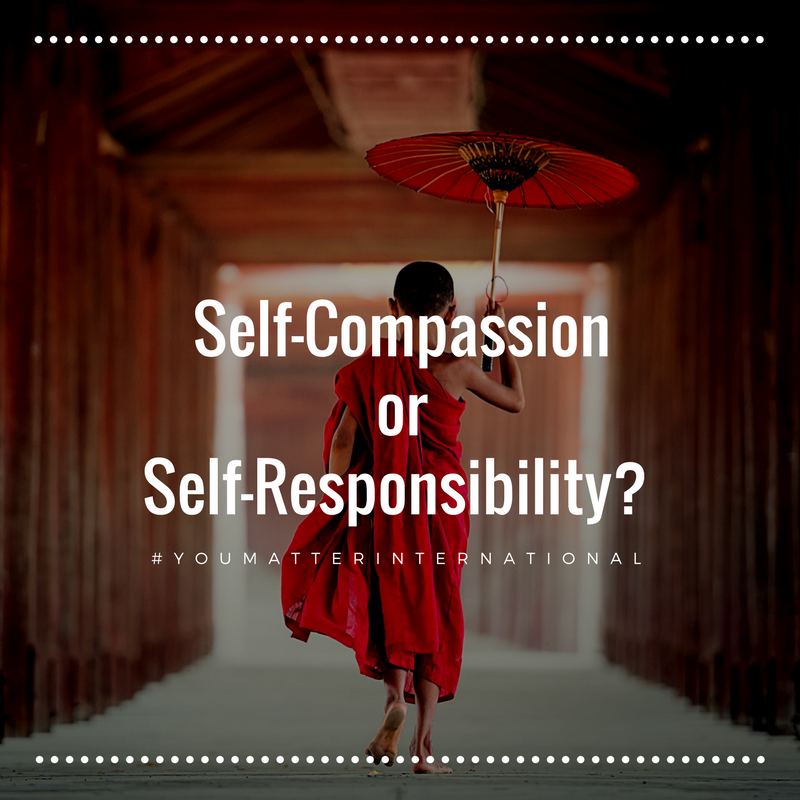 You might ask then how do I rectify becoming fully self-responsible for where I am in my life, with money and with health and with all of the things, while also having heaps of loving self-compassion for what has come about? Can I lovingly accept my imperfections, my falls, my moments of victimhood and my moments as perpetrator in order to be more fully human? A human capable of being a bigger vehicle for real love, which sees all, accepts all, and chooses to embody and gift big heapings of acceptance to the world? I think that holding a very loving and compassionate dose of self-responsibility is key to claiming a fulfilling life. Maybe in fact, it’s totally an expression of self-love to accept self-responsibility (empowerment) for being able to be with life as it is. And from as it is, we can then steer our life towards that which we want to create, all while holding huge heaps of self-love and self-compassion for the as-isness of life now. I love that the quote on self-compassion in The Little Money Bible actually would then imply that by holding that, we actually align more to loving flow, and ultimately to gratitude and amplification of the metaphysical attraction energy that will bring more of what we are wanting into our lives. So maybe heaps of self-responsibility (empowered view) and self-compassion can help us to bring about more loving joy in the world, manifest as action, energy, and money, that we can then spread around for the good of life! This is certainly my mission, and I am grateful for the many of you who are aligned on this path! Here is to a year of heaps of loving self-compassion, coupled with intentional alignment to the flow of love and divine expression in life as our Love Bomber selves. Here is to the amplification of love in action, of connection, of healing. Love really is brave isn’t it? P.S. 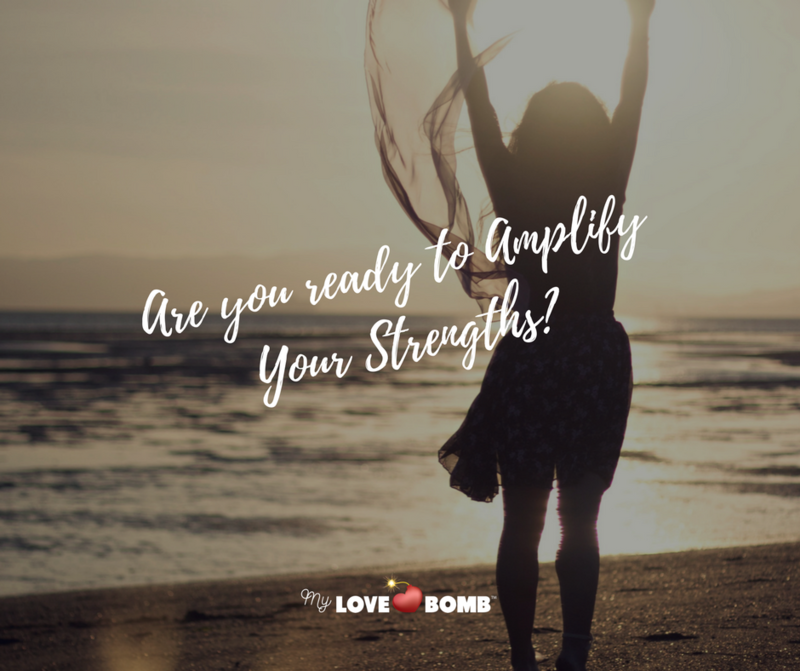 Ready for a deep dive transformation process focused on absolute unconditional loving approval designed to help you amplify your gifts to life? Consider joining us in the My Love Bomb Program starting February 5 - March 30 or bring it to your town as a My Love Bomb Program Facilitator this year by taking the program virtually February 5th-March 30th and signing up for the 2018 Facilitator Training. Hi! Rhea here with this week's My Love Bomb Program insider scoop, as I work to bringing you applicable content while running the eight week program. Last night's small group portion in Napa brought me so much ease, connection, support, encouragement. Oh my gosh, basically, the best of what can happen when women come together in a calm space and drop into being. I'm bringing you a continuation from last week's theme of "asking" with the next steps of action, identifying harmony, innate trust, and finding life momentum. With so much to attend to in terms of the loving service we can provide to hold up one another when we have fallen, or the world has crumbled a bit around us, it's vital to do the work to be standing love bombers capable of offering clear vibrations of uplifted love and insight. We need to be leaders in our own lives whenever possible, so that we can be more effective love bombers when nature is calling, which, she is. I hope this helps you build more ease and harmony inside of your body, your mind, your life, your community, and our collective humanity. Today’s message is a brave one for me to share, however, the desire to be of service to those who need to hear it is winning. Check it out. I come to you a woman who has experienced the need to advocate for herself inside of her marriage and family life to say “this is valuable to me, end of story, I am worth it” when it comes to asking for time or money towards something that will benefit me. I also come to you as a provider of “alternative” to mainstream culture offerings such as chiropractic for whole person healing and personal growth seminars for 11 years. I have felt and seen similar patterns and that’s what I am talking about today. The pattern is this: our families tend to have value systems, whether they are spoken or not. Maybe we value vacations, maybe we don’t. Maybe we value proactive health and wellness care. Maybe we don’t. Maybe we value personal time. Maybe we don’t. Maybe we value personal growth. Maybe we don’t. You get it. Well, I am promoting something here- it’s valuing the truth of one another’s hearts. Even if where they are being innately led to is “not going to work.” Change is unknown. New paths are unknown. What if it’s okay to try something new? Okay, I’m not advocating huge investments of time or money that totally disrespects the needs of the family members. I am advocating a freedom to look at supporting things that might be outside of the norm of what would be valued in order to try expanding into a framework of family and personal values towards personal growth, health, and well-being. So what is it that you are valuing? Where is your heart leading you? Are you worth it? If not now, then when? Don’t wait until it’s a fire. Pay attention to your heart’s desire while it’s a little flame, and honor that in those that you love! Then it’s a fire of a lit up life, versus a crew in crisis.